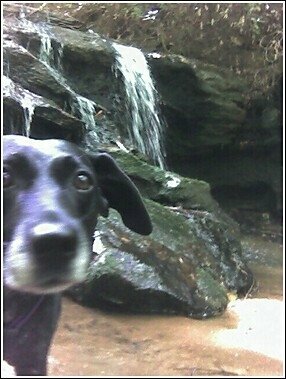 Sweet Lexie exploring at the base of a waterfall in North Carolina. What really made the camping trip memorable were the ticks. 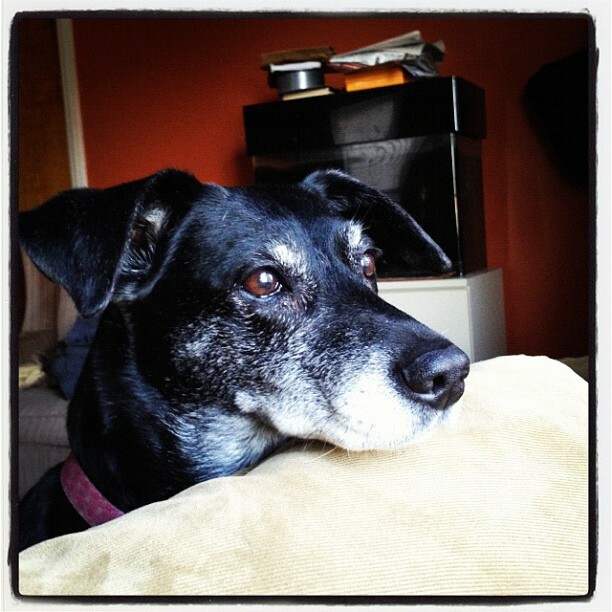 After a long, tear-filled week, this afternoon I said a final goodbye to my almost-15-year-old dog Lexie. Writing this elegy is easy and heartbreaking. 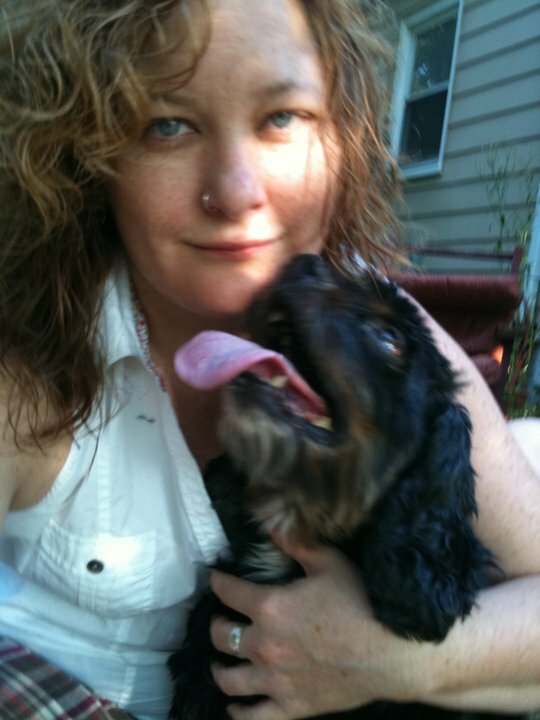 Lexie lifted me on days I could not move; she loved me fiercely, and taught me how to properly cuddle. Telling our lovestory is like spinning a campfire tale. Her spirit leads me, like fireflies blinking into the night. If Lex was anything, she was nearly human. As evidenced by her dew claws, the pup practically had two thumbs, and got into all sorts of trouble because of it. Right away, it was clear she was a master at stealing food. It was stealth skill I learned of in her first week with me after she ate an entire container of freshly baked chocolate chip cookies. I found her afterward, licking the Tupperware lid. Amazingly, she didn’t leave a crumb behind. Lex could unscrew the lids of jars of candy or peanuts. She made an art of emptying the garbage can. She also knew how to magically remove full loaves of bread from the top of the stove. I often joked that she knew how to operate the step-stool, and honestly believe it’s a serious possibility. Lex was so loved that she even was dognapped once. I retrieved her a week later, and rarely let her out of my sight after that. She loved being at home so much that she ran away just one time. I had woken up early, and somehow the wind had blown open our front door in the middle of the night. Lex simply walked out of the house. It was trash day, and Matt hopped on a bicycle at 6 a.m. to scour the streets. He found her about three blocks to the east casually sniffing a bush. More than anything, Lex loved negotiating space on the couch with Matt. They always ended up in some contorted pile of pillows and fur, both of them snoring away. Lex deeply loved her little brother, Charlie. She enthusiastically welcomed him into our family, and showed him the ropes to Big Dog World. She didn’t like playing dress up, although when she was younger she did allow me to suit up her paws in doggie muttluks for our winter walks. Lex never quite forgave me for that. Lex took part in a colorful journey, and was quite possibly more traveled than some people I know. 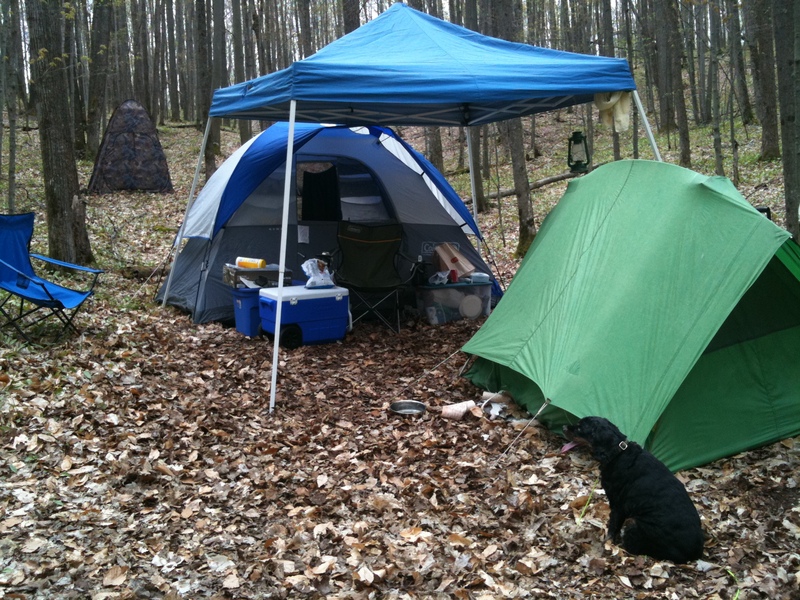 Over the years, she accompanied me on numerous camping trips, morel mushroom hunting and a two-month odyssey driving from Detroit to Miami and back again. She demanded the front passenger seat when it was just us girls driving. Her eyes remained alert as we passed farms and skyscrapers. She didn’t want to miss a thing. If anything, Lexie was a fighter. She came close to death last year, and unbelieveably fought her way through kidney failure. But she was no match for dementia and old age. She no longer knew who I was, and frequently got lost in the house. Her hind legs betrayed her, refusing to hold her weight. She frequently fell off her favorite chair, and recently got stuck behind our couch. 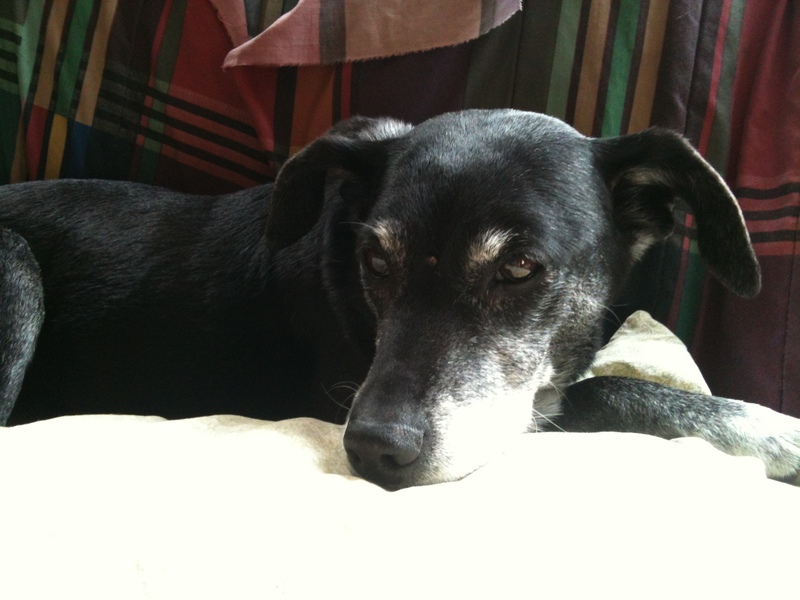 More than that, our vet told us that Lex lived in constant anxiety, and that medication was not an option. We had simply come to the end of the road. It was time to say goodbye. I learned early in my newspapering career, that not everyone equally values the death of a loved dog. 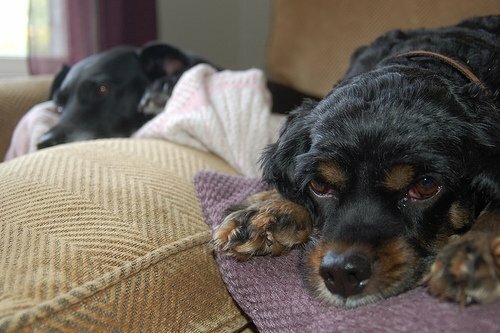 Once I was written up by an editor after I expressed despair upon learning the death of my dog, Barkley. I didn’t think my tears were out of line, but a coworker was upset and complained because she thought I had lost a child. In many ways I had. In many ways I have, in losing Lexie. As a 43-year-old, never-been-married spinster, I know Lexie was a close proxy. The reality is that I may never have children, and she, indeed, was my baby. Sleep well, darling. Mama loves you. Lexie rests after pacing through the house all afternoon. It’s been almost a year since Lexie recognized her own name. Slowly, her eyes lost focus. Then she simply forgot who I am. Each day when we meet, it’s as if for the first time. She opens her mouth wide, and gently nibbles my hands for a clue to who I could be. Some days she will lower her head onto my lap. Other days she simply walks away, to start her endless circling path around the coffee table. Dementia has stolen our baby Lex. She hardly barks any more. A dog treat barely registers more than a mouthy snap. For 15 years she has been my constant companion. So when symptoms of her dementia reared up this month —including her getting stuck behind our couch — I knew it was time to get her evaluated. The vet was shocked at her appearance. Lex had lost 3 pounds since our last visit. Her eyes seemed distant. She was not friendly or open to meeting the vet tech. During the physical exam, Lexie snapped at the vet. Before I could process the situation, the tech placed a muzzle on Lexie’s snout. She writhed and shed what seemed to be at least half of her coat. I put my hand on Lexie’s chest, and did my best to calm her. As her eyes rolled around the room, I could see the terror rise up. The vet didn’t mince words. She said Lexie lives in a world of fear and anxiety. Sadly, anti-anxiety/depression medications would only lift her inhibitions, possibly leading to more dog bites. If Lex was her dog, she didn’t think it would be fair to keep her in this emotionally painful space. The tears were falling into my lap before she passed me a tissue. She offered to put Lexie down right then if I wished. I wondered if this was some sort of bad dream. I told her Matt and I would have to talk, and that we’d get back to her with our decision. My heart aches. I can’t imagine my world without my Lexie Doodle. But I know the vet’s right. At this point in the game, it’s not a matter of if … but when. So we needed puppy treats. I swear. And that meant we got to see the cats on display at PetCo. 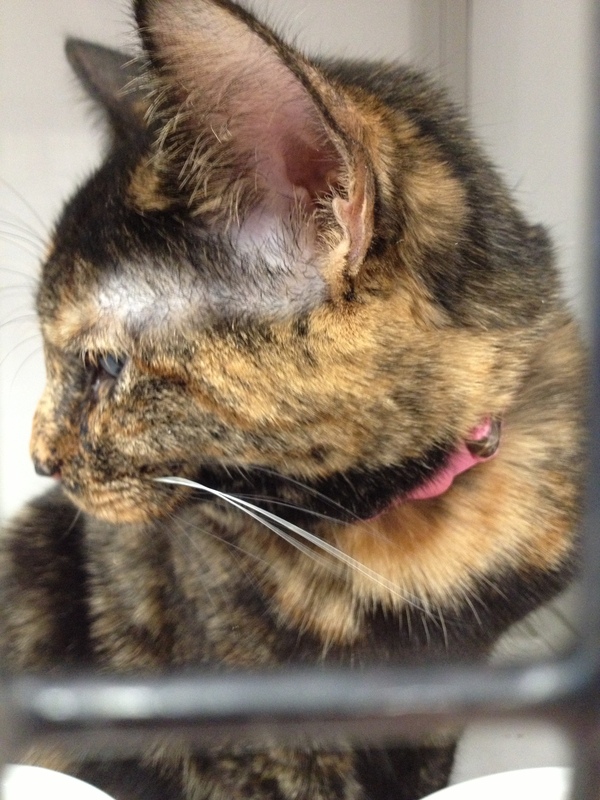 Matt and I both walked right up to Lola, a 7-month-old tortoiseshell kitten. She was curled up in a ball, snoozing away. We stuck our fingers through the cage and ruffled her tri-colored fur. Lola sleepily tossed her head over her shoulder and looked me over with one eye. She slinked her body a few inches so she could get a better look. I slid my finger under her chin, and rubbed. She closed her eyes and purred. This was one smitten kitten. I imagined Lola running through the house, maybe batting Charlie in the face then scurrying off to hide. I’m sure Lexie would be nonplussed. It’s been five months since Pink died. At the time we swore we wouldn’t get another cat for 10 years. So much for promises. I can feel our resolve slowly giving way. 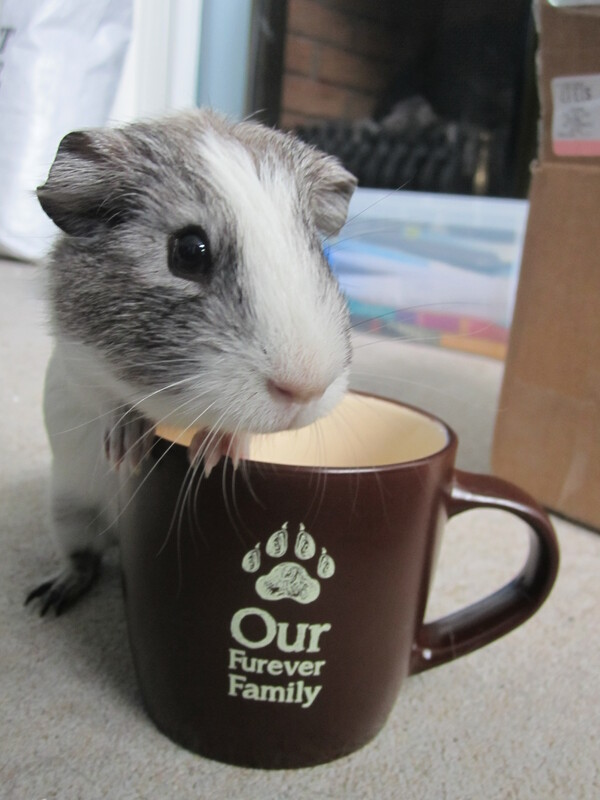 We couldn’t get Lola to look straight at us for a photo, so this is a pic of the profile photo on her cage. I wondered what this meant, so I Googled it. 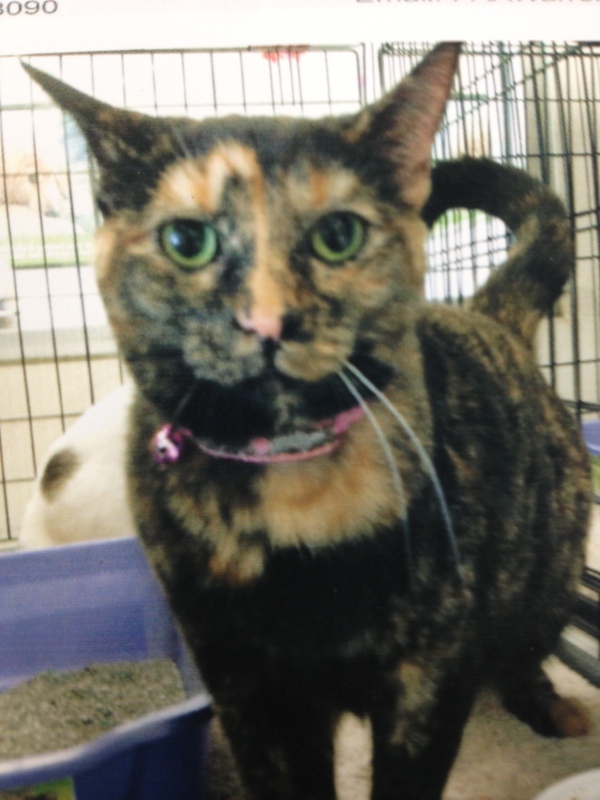 Apparently, tortie cats are known to be especially verbal, through meows, purrs and hisses. I looked at Lola in that cage. I couldn’t elicit any sort of sound from her. I was curious about what her meow sounds like. I also found out that tortie cats are believed to be good luck, and sometimes are referred to as money cats. Seriously. Can anyone give me one reason why we shouldn’t consider this cat?? I thought about her curled up on my lap, especially as I recuperate from my upcoming hysterectomy. She looked like a total snuggle bunny. Since I’m guessing the dogs most likely won’t be welcome anywhere near my lap, a little kitten sounds like the perfect recovery buddy. As Matt took dozens of photos of Lola, I scribbled down the contact information for the adoption agency. I leaned in close to take a video and … oh my, WHAT’S THAT SMELL??? Lola casually gave us a look that reassured that it was not her. She did not just take a humongous poop while we were fawning over her. The tenants downstairs are an embarrassment, she said with her green eyes. We peeked down below, and the black cat seemed pleased with himself. Once we got in the car, I looked up Lola’s profile on the adoption agency’s website. I’m nervous about possibly adopting another cat. But I am curious about this one. It looks like the next step is to fill out an application to set up a meet-and-greet. This is not Cheddar. Angry Eyebrows took him away before we could snap a pic. This is a different ginger cat I spotted at another adoption fair. Super cute. I visited him twice. Ask Matt what my favorite part of going to the pet store is and he’ll easily answer you. Every time we go to PetCo or Petsmart, I immediately make a beeline for the spot where rescue organizations set up shop with their furry felines. It’s been months since we lost Pink, and I can’t deny that I miss the pussycat purr in our home. Last weekend we needed dog treats and we decided to go to PetCo since it carries Charlie’s favorite in bulk. We also put the treats on top of Lexie’s kibble to encourage her to eat. We walked in the store, and right into heaven … or should I say a cat adoption fair. 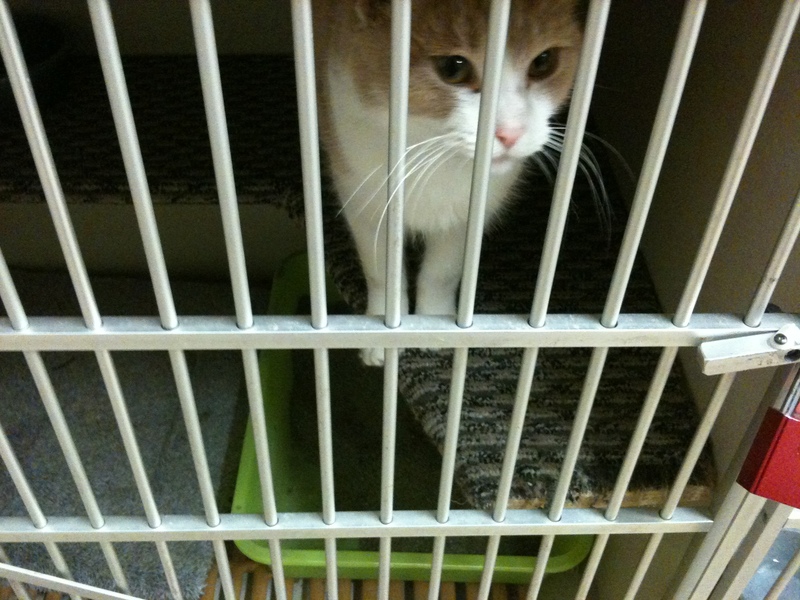 The second cage had an orange stripey cat. he came right to the front and pressed his body against the bars. I’m a sucker for a ginger. “He’s a cutie!” I whispered to Matt. He nodded. As I pushed my finger through the cage bars to touch the kitty’s nose, a woman wormed her way between Matt and me. “Would you like to hold him?” she asked, already opening the cage and reaching in to grab the cat. “Umm, sure,” I said. I was happy to hold a cat again, but not exactly sure I was ready to make a commitment right then and there. The woman put the cat in my arms. As I looked up to ask the cat’s name, I was startled. By the woman’s angry eyebrows. They were clearly painted on … in an angry fashion. “His name is Cheddar,” she said. We asked if he got along with dogs, and she said she had one dog at home but she wasn’t really sure how they got along. The woman told us she has numerous cats, and they all got along. We told Angry Eyebrows that we had two dogs, and she bristled. We said they were relatively small, and lived with a cat before. She looked away, disinterested. I explained that Pink was not an outside cat. She loved sleeping on her cat perch or the couch. But she had wandered out the dog door a few times, only to wander about five or six feet before running back inside. I explained all of this, but Angry Eyebrows wasn’t having any of it. She grabbed Cheddar, and pulled him tightly to her chest. And with that, our cat adoption interview was over. This was for a cat we didn’t really want to adopt in the first place, but suddenly I was pissed that I was summarily dismissed. I wondered if we would ever be allowed to adopt a cat with our dog door. I imagined us boarding over the hole in the side door, and growing frustrated as Charlie took to pooping in the library again. With gusto. Could it be Angry Eyebrows was right? Regardless, I came to accept it just wasn’t the right cat. We’ll keep looking. I know the fuzzball is out there. Lexie and Lili on top of pillow mountain. Long before Charlie, Lexie had another love in her life. Lili was a barrel-shaped black-and-tan cocker spaniel, with a penchant for licking anything. Hence the nickname Lili the Licker. I rescued Lili from my former partner’s relative, who could not care for her anymore. Before I got her, Lili spent a good portion of her first year cooped up in a bathroom; after I brought her home I would often find her curled up in front of our toilet. Lili stands guard at base camp. The bond between Lex and Lili was fast and fierce. They followed each other through the house, and cuddled up together on the couch for a nap. Together they both learned what it meant to go camping, and the freedom of chasing wild animals through the woods. And then there was what I’ll call “The Kissing Game.” Aah, yes. At first guests would find it charming. “Oh look, they’re kissing!” they would say, pointing at Lex and Lili’s makeout session. But after a few minutes, the mood would turn awkward. The feverish licking continued. And then, a couple minutes more — and they would still be going at it like a couple of teenagers, um, in heat. “Go get a dog house,” I would cry out, pulling them apart, as my guests averted their eyes. Clearly I needed to have a talk with the girls about appropriate behavior when we had friends over. They loved taking walks together. In all kinds of weather. This led to various accessories, ranging from doggie rain coats to Mutt-Luk booties to keep salt from bothering their tender paws. Once I snapped the leashes on them, Lex and Lili knew only one speed: GO! I was that person, both arms outstretched, blindly following two dogs trying out for a mush team. Lili was a delicate flower. She had allergies that would cause her to break out in terrible sores. And then there were the ear infections. It was such a terrible case, that even her allergist could not prevent her from going deaf. We tried everything, including feeding her venison I bought at a wild game shop. I’d say there were moments when her allergies would subside, but inevitably they would return, raging out of control. Even with her smelly ears, Lili was the only one for Lexie. She never turned her nose, and always snuggled in a bit closer. 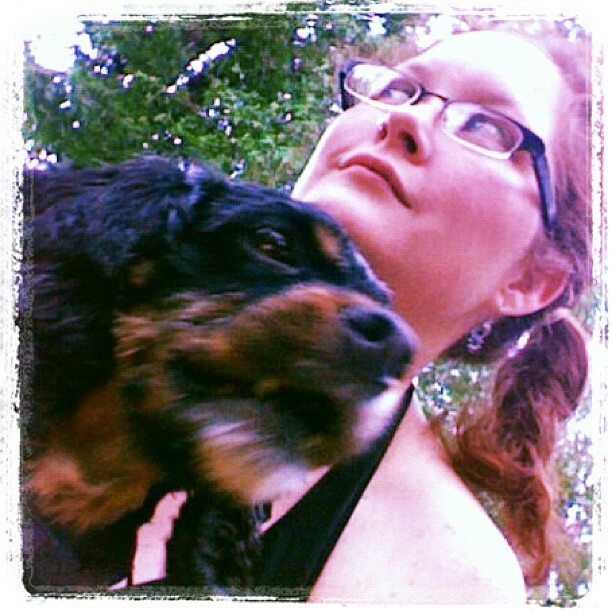 Lili and Jilli wait for a summer storm. The first time I heard her howl I thought she had broken a leg. My heart raced as I ran back into the house, only to find her happily panting. It was the beginning of a lifetime of false alarms. Fool me once, fool me a thousand times! Lex and Lili were like an old married couple. They waited for each other before climbing the stairs to go to bed. They ate at the same time. They peed in unison on walks. Their bond was unbreakable. So when Lili died, I was unsure if Lexie would survive. For days, Lex curled up on Lili’s smelly pillow. She moped, and didn’t eat. She lost weight. But eventually she started showing interest in the world again. A year passed, and I’m sure she was convinced she would finish her days as a spinster. Love is tender and unpredictable. And love has found Lexie again.